Want to know how to repost on Instagram? Want to learn how to effectively incorporate Instagram reposting into your Instagram strategy? Instagram truly is the social media platform of this era which has exploded dramatically over the years. Instagram enables you to share the most amazing moments with your followers and enables a great storytelling to captivate and engage your audience, but what if you don’t want to upload your own picture but instead want to repost another account’s Instagram post? There are many reasons why you might want to repost on Instagram. Maybe you just don’t have anything to share with your audience, maybe you’ve seen an inspiring post which you now want to share with your audience to pass on the value that you yourself got from it. With millions of millions of posts being shared daily on Instagram, it’s easy to come across something that you like. Especially now thanks to Instagram’s Explore feature which presents content to explore that it believes you’ll find appealing based on your activity on Instagram. The temptations are big around us when on Instagram, and no matter we look, there are beautiful posts that are worth reposting. But if you’ve been in that position, you’ve probably also found that there is no built-in obvious feature with which you can seamlessly repost on Instagram. At first, this is quite surprising as a repost feature is something that most social platforms have. Pinterest has repin, Twitter has retweet, Facebook has a share feature, and so on. But Instagram has… well, no such thing. Built-in reposting features within the social media platforms are extremely helpful as they only demand a single tap. But as for Instagram, where there’s a will, there’s a way, and now, the users of Instagram have been reposting on the platform probably as long as Instagram has existed. 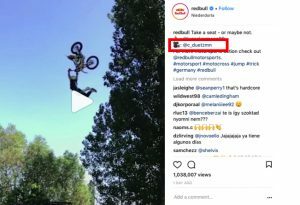 In other words, the ways of reposting on Instagram are tried and true and there have been a lot of experimenting and testing of how you can repost on Instagram most effectively. If you see an amazing post on Instagram and want to repost it, how do you do it? Currently, there is no official reposting feature, and probably never will, because Instagram wants its platform to consist of original content as opposed to being a place where everyone just reposts other people’s content. This is because this could potentially lead to Instagram losing its personal touch and genuity. In this post, you’ll learn how to repost on Instagram. As you’ve probably guessed by now, there are a number of different ways you can go about to repost on Instagram. 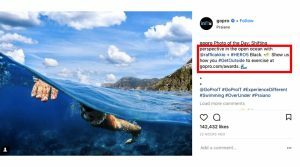 Most people use third-party apps and tools to repost on Instagram, but others have found my effective and quick ways to repost someone’s posts to their account. Let’s begin looking at the manual ways without any third-party apps or tools with which you can repost content on Instagram. You might say that there are two ways to repost on Instagram. Firstly, there’s the method which includes you saving the image that you want to repost and then manually uploading it like you would with a regular post. Then, there’s the app method which, at least with some apps, allows you to make a few taps and then, though the app, repost someone’s Instagram post directly to your account. The latter is undeniably the most seamless way to repost on Instagram, however, it also come with a few downsides which I’ll go into further on. This is undoubtedly the most popular and most effective way to go about to repost on Instagram. As you probably know and recognize in yourself, people are generally reluctant to downloading third-party apps and other tools. This is because firstly, they don’t know if they even work, and secondly, it means they have to learn how to use them. Fortunately, we have at least two methods we can do this on. One of them, which is the most popular, is a method which can be used no matter which device you have. In order to upload a picture on Instagram, you first need to have the image in your photo library. There’s no rocket science there. So how can you take a post that you’ve seen on Instagram and move it to your photo library so ultimately, you can repost it? The absolute most popular method to save a photo on Instagram is to screenshot the image and then upload it. It is very straightforward actually. Simply find out how you take a screenshot on your device and then go to the post you’d like to repost, screenshot it and then upload it just like you would with any other post. For best quality, go to your photo library once you’ve taken the screenshot and then crop the edges before uploading it. Another way to repost on Instagram (and save a photo from Instagram to be able to repost) is to use an online Instagram photo downloader. Instagram repost apps (which I’ll go through in a moment) are essentially just that, as many of them download the photo to your device before reposting it to your own account. The only difference here is that you, instead of using a third-party app is going to use a website which helps you download posts that you’ve seen on Instagram as opposed to screenshotting them. There are a few websites out there that will help you with downloading photos from Instagram, and the best part is that you can use them directly in your browser without having to download an app or tool. 1. Go to Instagram and find a post you want to save and repost. 2. If you are using your computer, you can copy the URL that you have right there and then – if you are using your phone, tap the three dots in the top right corner and select copy link. Note that they have had some trouble with downloading photos using a mobile device, so give it a try if it works. 3. Paste the URL into the bar on the website and select download. 4. Your image should have been downloaded. Downloadgram is one of the most popular sites to download Instagram photos with. Downloading a post is very straightforward – just follow the same steps as above. While using the screenshot method is effective, using a third-party app can sometimes be even easier and more seamless. There are loads of third-party apps for Instagram that will help you reposting both videos and photos. Either you can repost the photo straight to your page but a lot of people don´t like doing this since the photo gets a text that gives credit to the original photographer on itself. Sure, it’s important to give the correct credit (since you can get banned on Instagram if you don’t) but you can also do this in the caption section which helps you post more clean photos. You can also save photos straight to your camera roll on some of the apps. There’s no way to do this on Instagram directly, but through the website Gramfeed you can do just that. Simply sign in with your Instagram log-in and click on the photo you want to save. In the upper-right corner, hit “Download.” This will open the photo in a new tab, and all you have to do is drag it to your desktop. You can save photos on Instagram on your computer. 4K Stogram is a program that helps you with this. If you want to repost a video on Instagram, you face another challenge. Obviously, you cannot screenshot a video and then repost the video that way. Instead, you need a different approach, and while reposing a video on Instagram is generally a little trickier than reposting a photo, it doesn’t have to be more difficult if you use the right method. The only way to repost a video on Instagram is to use a tool. There’s no built-in feature on Instagram, instead, you need to do it manually. The first method is to use a repost app, and the second method is to use a video downloader and then manually upload the video. There’s technically a third method of reposting videos on Instagram, and that is to use an Instagram ”repost/download” app. This is the most common and often the most simple way to repost videos on Instagram. The problem with this is that the supply of repost apps on Instagram is limited, at least if you look at the ones that are free. Also, there are many repost apps that haven’t received very good reviews which people don’t find working very well or at all. Also, while there are a few free apps out there which allows you to repost videos on Instagram, the majority are paid, and the vast majority of the ones that are free only offer a small number of reposts, then ask you to buy ”coins” to continue reposting. Instarepost app is definitely one of the best and most powerful apps to repost on Instagram. This app doesn’t only allow you to repost videos, but also videos. It also adds watermarks to the original owner. The app is free to download but offers in-app purchases that cost between about $1 – $200 per item. Repost for Instagram is another repost app that enables you to repost both photos and videos on the platform. It is free to download but offers a ”pro upgrade”. The app enables you to repost your favorite photos & videos on Instagram while giving credit to the original Instagrammer. All you need to do to repost is to copy the share URL and open the Repost app. When in the app, you can position the attribution mark and send the reposted media back to Instagram. The app is only available on the App Store for iOS devices. This is a third Instagram repost app that you can use. The app allows you to repost on Instagram without watermark if you want to avoid ugly watermarks on your posts. The app is 100% free and offers no in-app purchases. This means that you can use the app as much as you want, whenever you want. Regrann is an Instagram repost app for iPhone and iPad, and unlike other repost apps, you can instantly share the photos and videos you found on Instagram right from the Instagram app. 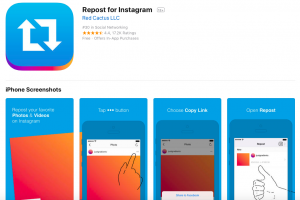 The last Instagram repost app is Reposter. This is an app that will repost photos and videos on Instagram as well as a number of different platforms. The app includes no watermarks to the posts you repost. Reposting on Instagram is great for many reasons. At the same time reposting on Instagram has also been discussed quite a lot as some people dislike it. If you’re using Instagram regularly as a business (which you should), you’ve probably found yourself lacking content every now and then, because constantly producing content for Instagram can be a challenging and stressful task, to say the least. This is a time when reposting on Instagram comes in handy. When reposting content on Instagram, you don’t have to create your own content. This is why reposting on Instagram is a great solution when you’re lacking content to share on the platform, and maybe don’t want to compromise quality for quantity. Many brands have implemented reposting as part of their Instagram content strategy, because apart from saving you time and resources from not having to produce content all the time, reposting on Instagram actually comes with a number of marketing benefits as well. This is a big benefit of reposting content from your customers that contribute to marketing results, as mentioned earlier. You can frequently see brands incorporating this tactic into their social media strategy. 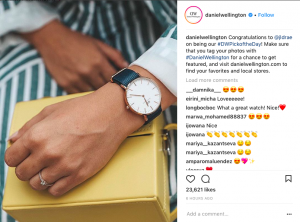 Daniel Wellington is just one of many brands that repost content from their audience. With their hashtag #DWpickoftheday, they encourage their audience to take photos of their watches and tag their posts with that hashtag. 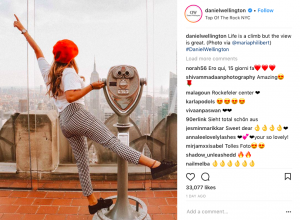 Daniel Wellington then picks a post from the people who have shared images and incorporated that hashtag and reposts it to their own account. This way, they can show their audience that they see them and value them. The best part about leveraging the tip in point number one is that you engage your audience and encourage them to share more user-generated content. Not only does this provide you with a bigger selection of content to use, but it also brings more exposure to your brand. The more people who share content about your brand, the more exposure you’ll get. It becomes a free promotion for your brand in other words, and all you have to do is repost content from your audience and maybe reward those who do in different ways, for example arranging giveaways for the people who share user-generated content about your brand. People love seeing things behind-the-scenes perspective as opposed to the polished surface that most brands showcase to the public. But if you are the only one who creates the content for your brand, there’s a risk that your content will have a hard time mediating that. This is why reposting content from events and other behind-the-scenes things can not only be a good source of content but also a tremendous way for you to humanize your brand. Believe it or not, but your audience is most likely talking about your brand on social media. The problem is that most brands miss out on it because they just don’t listen. By putting social listening into play, you ensure that you hear everything that people say about your brand and can take appropriate action. Furthermore, it also gives you access to content which you otherwise wouldn’t have found. If you’re a brand, you’re always looking for content to repost which your customers and audience have created, not just any content, and if you aren’t actively scanning social media and keeping track of the user-generated content that is being shared, you’re missing out on tremendously valuable content. Reposting your audiences’ content is a great way to acknowledge your customers, but what’s even more powerful is to acknowledge your most loyal fans who are crazy about your brand. Of course, before you can repost their content, you need to actually listen to find them. This means that you need to actively listen to what is being said and who are screaming the loudest about your brand. If people don’t feel seen and appreciated, there’s a risk that they’ll go somewhere else, and this goes for your most loyal customers too. The best part is that if you acknowledge them, for example by reposting, they can become even greater ambassadors for your brand. It doesn’t cost a lot and can even be completely free in terms of money. A great way to encourage user-generated content from your audience which you can repost on Instagram is to make them part of something. This will not only make them feel like they have contributed to making it, but it will also help you bring the event more exposure and a greater engagement. For example, if you reach 100K followers, you can create a campaign where you encourage your audience to share an Instagram post with the hashtag #yourbrand100k! You can then select the top posts that people have shared, repost them, and reward them with something. This is a big deal and a super important part that you need to have in mind when reposting other people’s content. As opposed to platforms like Twitter and Instagram, you cannot just repost other people’s content on Instagram and not worry about copyright and that you are stealing other people’s content. The way you do this is by giving credit to the owner. However, that is not all. Technically, just giving credit to the owner by either adding a watermark to the owner by using a repost app or writing ”photo by @” in the caption isn’t enough, and is still copyright infringement. When you repost someone’s post, most people will just be honored and happy and have nothing against it, but some people might get angry and report your account. At worst, maybe sue you. This is why if you want to stay on the safe side, you need to ask the owner for permission first. What you’ll find is that most people will just be happy to have you repost their content, but you might also meet someone who doesn’t approve, and in that case, it will be good to have asked and not reposted their content right away and made them angry. Do note, however, that just because you ask for permission doesn’t mean that you should not give them credit. Hope you found this article helpful! Don’t hesitate to let me know in the comment section below if you have any further questions.